Between the sedan, coupe, hatchback, Si, and Type R, the Honda Civic already has enough variants to satisfy most customers. But now Honda has gone one step further and done the unthinkable by converting the Civic Type R hot hatch into a pickup truck. 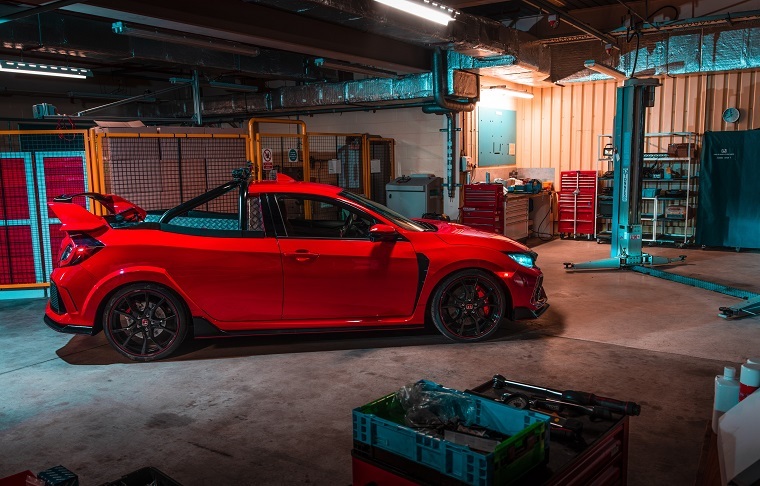 Displayed at the Society of Motor Manufacturers and Traders (SMMT) annual Test Day, the vehicle—internally known as “Project P”—was built after-hours by Honda’s UK voluntary race team, Synchro Motorsport, at the company’s Swindon plant, where all hatchback Civics are assembled. Nearly everything behind the car’s B-pillars has been changed, though not the wing—you can’t have a Type R of any kind without a ridiculously large wing, after all. Fortunately, it’s movable, allowing for unfettered access to what has turned out to be an impressively large bed. More importantly, the hatchback retains all of the 306 horsepower and 295 lb-ft of torque produced by the 2.0-liter turbo-four, as well as the adaptive suspension, six-speed manual, and various driving modes of the regular model. This means that, according to Honda, the Type R pickup concept should be able to hit 62 miles per hour in under six seconds and reach a top speed of over 165 mph. And Honda isn’t stopping there. “We are even considering taking it to the Nürburgring to see if we can take the record for fastest front-wheel-drive pickup truck,” said Alyn James, project lead. The Type R already holds the front-wheel-drive car record around the famous circuit, so it’s certainly not implausible.